As usual the drink sitting in front of me has yet to be experienced by my taste buds. Today’s installment shall be titled “Double Cola”. Double Cola, according to the bottle, has “Double Measure” and “Double Pleasure”. I find it kind of odd that the word “double” (which is looking less like a word every time I type it) is prominently displayed on this bottle three times. Double Cola, according to Wikipedia, comes from the Ski line of beverages… none of which I have personally tasted but some of which I’ve been told to. With that said I fully expect a super strong cola with this one. Shouldn’t I? I mean it’s double cola which I assume means double the cola flavor. Let’s find out shall we? This isn’t what I expected at all. Where’s the bite? I expected a very strong bite to assault my throat like a hot Coke. What I got was one of the smoother colas I’ve consumed which I would normally associate with weakness in flavor. Not here. 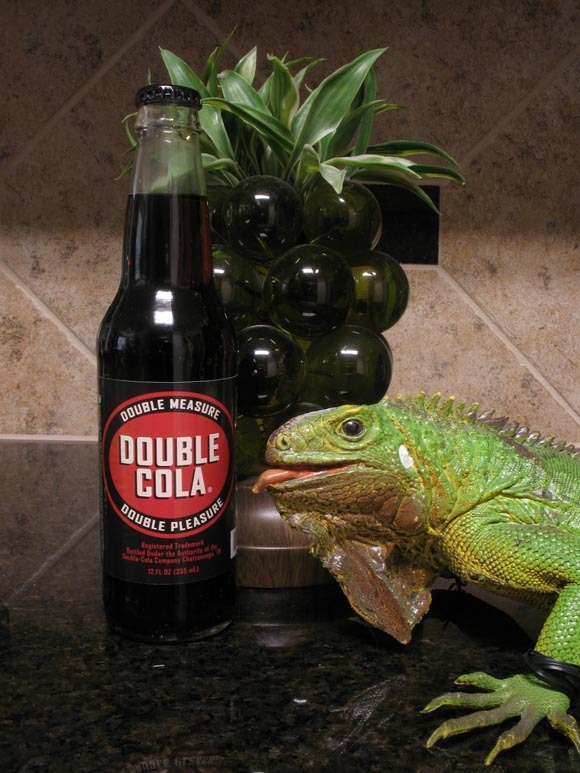 Double Cola lives up to its name though, unlike "hilarious reference here", with a strong almost magical cola flavor. The more I drink this the more I like it. The deep cola flavor soaks into my mouth making sure I get the most out of each sip. The cane sugar sweetening this cola makes sure it never feels syrupy during the consumption process. I know I just said it wasn’t syrupy but the cola flavoring compares closest to cola flavored sno-cone syrup. Not the sno-cone itself but the highest of rewards that awaits you in the bottom of your sno-cone. You just thought a sno-cone was a dessert. No, sir. The dessert is the 35 milliliters of syrup that sit at the bottom of your Styrofoam cup. Sorry to all you folks that only had sno-cones in actual paper cones. Styrofoam cups are where it’s at in the world of sno-cone. With all that said Double Cola delivered today. I will now list this as one of the best colas I’ve ever had. Try it and you will too! Twist's pleasure was actually tripled. He knows how to work the system.